December 12, 2018 -- Learning Sites has been selected by Global Business Insight as the "Best in Educational Software Development Services 2019" for the entire United States! Global Business Insight writes: ""The 2018/2019 Global Business Insight Awards are an exact illustration of the very best this essential and competitive industry as to offer. By concentrating on a wealth of disciplines, our awards will endeavour to identify and celebrate those individuals and businesses within the Business Insight umbrella. From Financial Services and Technology to Construction and Healthcare – all sectors and company sizes are welcome, including individual recognition for outstanding achievements. Using our far-reaching and intense research process, we guarantee the selection of only the elite for our prestigious honours. By concentrating on individuals, teams and organisations from a wealth of disciplines from CEOs to Young entrepreneurs, large corporations to sole traders, best procurement to best innovation and everything in between. Our awards endeavor to identify and celebrate those who fall within the Business Insight umbrella, whilst not forgetting the advisors who helped them get there!" 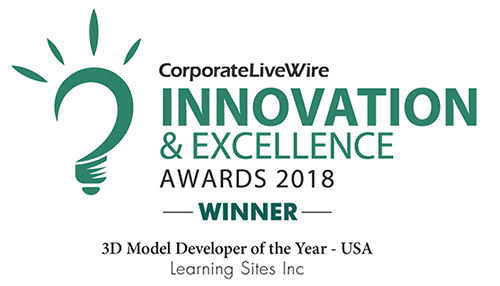 February 7, 2018 -- Learning Sites has been given the Corporate LiveWire's Innovation and Excellence Award for 2018 as the "3D Model Developer of the Year" ! The stringent categories upon which Corporate LiveWire base their awards include a company's innovation, products and services, general industry recognition, use of technology, and long-term sustainability of the corporation. A large panel of international experts then review the nominations. Learning Sites was chosen to represent the Technology, Media & Telecommunications sector for which the Corporate LiveWire's judging panel looked at companies who are optimising the software and technologies we currently use, as well as those who are offering completely new ways of interacting with the world. February 1, 2018 -- Learning Sites named "Best 3D Archaeological Visualizations Company for 2018" by US Business News in their North American Excellence awards category ! US Business News says: "Over recent years, North American companies have been one of the leading lights of the business domain. Despite the challenges and uncertainty that the industry faces, both organisations and individuals in this diverse region steadfastly refuse to let anything cease them from achieving true excellence in their respective sectors. To reward the ingenuity and sheer hard work of these firms and the individuals driving them, the 2018 North American Excellence Awards covers a wide spectrum of sectors from finance to real estate, manufacturing to retail. Business size, age or market are not considerations- in this awards programme we focus only on true excellence. Each of our award winners is chosen through a combination of votes gathered from our network of respected industry partners and our own rigorous in-house research. These awards aim to honor both companies and individual entrepreneurs within the corporate landscape whose hard work and consistency has been the driving force to their achievements." 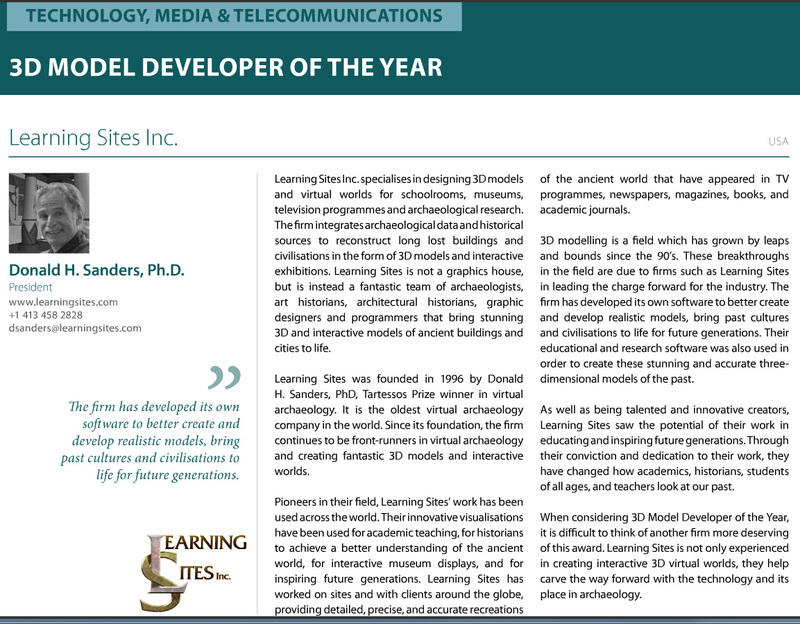 August 2, 2017 -- Learning Sites named "3D Model Developer of the Year for 2018 - USA" by Corporate LiveWire in their Innovation & Excellence award category ! The highly celebrated Corporate LiveWire Innovation & Excellence Awards 2018 give recognition to businesses that are transforming their respective industries and the standard-bearers of excellence by continually setting industry trends as well as showing significant advances in terms of innovation and improvement. The judges at Corporate LiveWire have chosen winners for innovation, industry recognition, service excellence, marketing & branding, and highlight those who have created a better successful future in their industry. December 13, 2016 -- Learning Sites named "Best Virtual Heritage Company for 2017" by Corporate America News in their North American Excellence award category ! "Over the past few years North American businesses have been one of the leading lights of the business domain. Despite the challenges and uncertainty that the industry faces, both these companies and individuals refuse to let anything cease them from achieving true excellence in their respective sectors. Therefore, the 2017 North American Excellence Awards honor the companies and individuals within the business industry, whose consistency to provide exceptional service has been the driving force behind their innovation and commitment to thrive within the sector. Regardless of the size of the firm, the age or even their specialization, these awards are centred around rewarding those whose stunning achievements have been the outcome of tireless efforts and passion for their work. 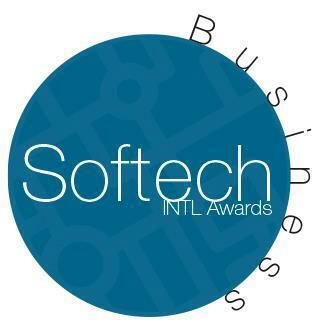 December 7, 2016 -- Learning Sites named "Best Virtual Heritage Company 2016" by Softech International Business ! "The Softech - Business Awards 2016 have been launched to commend leaders across a variety industry sectors; we are looking to those who are changing the field, dedicated, and fundamentally have saved the most important resource of all time. The awards recognise the those who provide an integral service, software or technology. Softech is essential to modern life. Software develops in leaps and bounds and as it does, it becomes more integrated into our day to day, improving our quality of life. With rapid evolution and development occurring daily we wanted to take the time and recognise the pioneers, industry leaders and the up & comers. 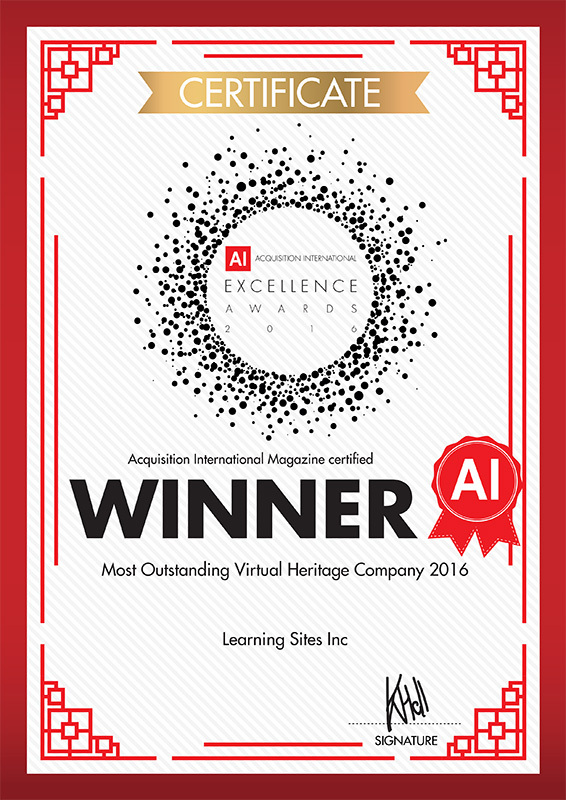 Nov. 30, 2016 -- Learning Sites wins the AI Global Media's Excellence Award as the Most Outstanding Virtual Heritage Company, 2016 ! "Through our awards, we strive to recognise and promote the most outstanding work carried out across the global corporate landscape every year, highlighting examples of spectacular commitment, professionalism, expertise, and of course, results that mark out our carefully chosen winners as something truly special. Every winner of one of our awards is carefully chosen, following a rigorous and considered nomination, voting, research and judging process designed to ensure that only the most deserving and top performing individuals and firms walk away as winners." Nov. 29, 2016 -- Learning Sites wins the 2017 Corporate America Boardroom Elite award for 2016 for "Most Innovative Educational Material Developer - Massachusetts." The 2017 Boardroom Elite Award has been designed to act as a guide to the very best of the best Executives, Senior Managers and Board Members whose skilful management and professional diligence has led their company to the success it enjoys today. This programme sought Leaders from across America and the corporate landscape, with sectors ranging from accounting to manufacturing, consultancy to technology and beyond. A 2017 Boardroom Elite award title is a true honor and privilege, as we carefully research everything from a nominee's region to their performance over the past 12 months, their commitment to innovation, their methods and even their competition to ensure that only the most deserving names walk away with one of our prestigious accolades. Nov. 22, 2016 -- Learning Sites wins the 2016 Corporate America Software & Technology award as the "Best Archaeological Visualization Company." With the corporate landscape becoming increasingly digital, many businesses are being defined by their online presence, and as such the need for quality technology support is increasingly vital. As such, the 2016 Technology & Software Awards focus on showcasing the hard work and commitment of the many businesses, departments, and individuals across this market who are not only keeping their clients at the top of their game, but also driving innovation and, potentially, changing the way we do business for the better. The programme has a wide reach, with everyone from the music to legal industries, Web development and support systems providers and beyond considered for these awards. As is the case with all of our awards, this program is based entirely on merit. Oct. 5, 2016 -- Learning Sites wins the 2017 Excellence and Innovation Award for "Best in Virtual Learning and Teaching Software," as voted by Corporate LiveWire. Over the past calendar year we have invited over 100,000 professionals working across the various corporate industries, the general public and our subscriber base to nominate associations, companies & individuals based on their achievements and strengths. Additionally Corporate Livewire s extensive research team has put forward a selection of individuals who have excelled within their sector. 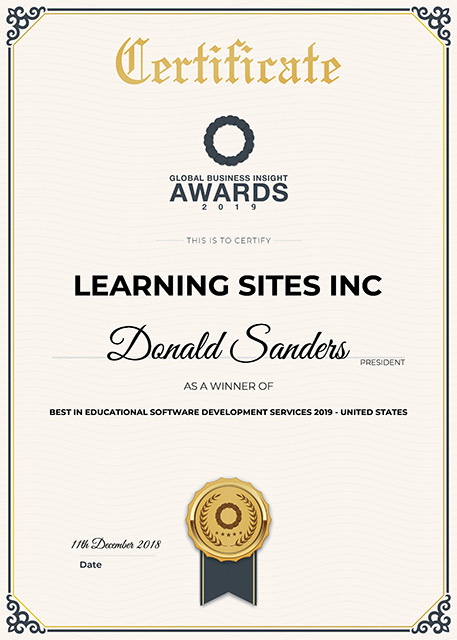 Oct. 3, 2016 -- Corporate Vision Magazine is honoured to announce that Donald Sanders and Learning Sites are the winners in the 2016 Executive Awards! as "the Most Pioneering Virtual Heritage Expert (USA)" & for "Excellence in Interactive History." The 2016 Executive Awards only reward the very best from across the globe. Being recognised is a real achievement. The 2016 Corporate Vision Executive Awards pay tribute to the shining stars of the executive world who form not just the backbone of their individual firms, but of their wider sectors and industries. Creativity, innovation and passion for the product or service are the things that separate great companies from merely good ones and these awards celebrate the individuals who, through their commitment to these areas, are the driving force behind their firms’ growth and prosperity. Sept. 19, 2016 -- Learning Sites Inc has been crowned: "Best Interactive 3D Archaeological Computer Models 2016 & Most Innovative Virtual Heritage Solutions 2016" by Corporate America News in their Small Cap category. Small cap companies work hard to stay at the forefront of the corporate landscape, as they compete against larger companies and increasing economic and political challenges. As such we have created the 2016 Small Cap Awards which aims to highlight the excellent work of the firms, and the people behind them, that shape the small cap space. We are not interested in industry or sector: the key is that the firms and individuals are dedicated to excellence. As is the case with all of our awards, this program is based entirely on merit. Once voting closes we will set our dedicated research team to work, leaving no stone unturned in order to ensure that every one of our winners can rest assured that their win is truly deserved. Learning Sites has been chosen as the 2015 Software & Technology award winner. "From the methods it uses to manage its people and internal processes, to the ways in which clients interact with it online - even its social media presence - almost everything about a firm is shaped by the decisions it makes - or restrictions placed upon it - concerning its uses of technology and software. "With this in mind, it is vital that businesses employ the most suitable and best possible tools available. The 2015 Technology & Software Awards are dedicated to bringing to the forefront the most technologically ground-breaking, user friendly and results-driven industry leaders operating in the US today. The awards shine the spotlight on the cutting edge individuals, departments and firms who, through their commitment, experience and willingness to push the boundaries of business-based technology, will shape and enhance the American business landscape for years to come. "Selecting these luminaries is the result of a rigorous judging process carried out by our dedicated awards team, during which we left no stone unturned to ensure that all winners were chosen purely on merit. This, of course, means that successful nominees can take real pride in being counted among the real leading lights in their industry." 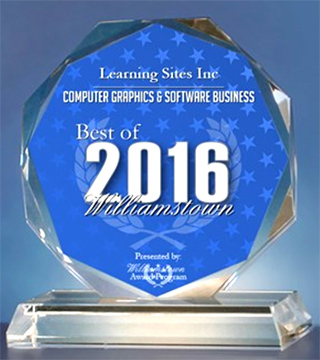 Learning Sites Inc. has been selected for the 2014 Best of Williamstown Award in the Computer Graphics & Software Business category by the Williamstown Award Program. Each year, the Williamstown Award Program identifies companies that we believe have achieved exceptional marketing success in their local community and business category. These are local companies that enhance the positive image of small business through service to their customers and our community. These exceptional companies help make the Williamstown area a great place to live, work and play. Various sources of information were gathered and analyzed to choose the winners in each category. The 2014 Williamstown Award Program focuses on quality, not quantity. Winners are determined based on the information gathered both internally by the Williamstown Award Program and data provided by third parties. The Williamstown Award Program is an annual awards program honoring the achievements and accomplishments of local businesses throughout the Williamstown area. Recognition is given to those companies that have shown the ability to use their best practices and implemented programs to generate competitive advantages and long-term value. The Williamstown Award Program was established to recognize the best of local businesses in our community. Our organization works exclusively with local business owners, trade groups, professional associations and other business advertising and marketing groups. Our mission is to recognize the small business community's contributions to the U.S. economy. Learning Sites has been selected for the 2013 Massachusetts Excellence Award amongst all its peers and competitors by the Small Business Institute for Excellence in Commerce (SBIEC). Each year the SBIEC conducts business surveys and industry research to identify companies that have achieved demonstrable success in their local business environment and industry category. They are recognized as having enhanced the commitment and contribution of small businesses through service to their customers and community. Small businesses of this caliber enhance the consumer driven stature that Massachusetts is renowned for. Learning Sites has consistently demonstrated a high regard for upholding business ethics and company values which is a trait seldom found in its industry. This recognition by SBIEC marks a significant achievement as an emerging leader within various competitors and is setting benchmarks that the industry should follow. As part of the industry research and business surveys, various sources of information were gathered and analyzed to choose the selected companies in each category. This research is part of an exhaustive process that encapsulates a year long immersion in the business climate of Massachusetts. About the SBIEC: The SBIEC is a leading authority on researching, evaluating and recognizing companies across a wide spectrum of industries that meet its stringent standards of excellence. It has spearheaded the idea of independent enterprise and entrepreneurial growth allowing businesses of all sizes to be recognized locally and encouraged globally. Particular emphasis is given to meeting and exceeding industry benchmarks for customer service, product quality and ethical practices. Industry leading standards and practices have been developed and implementation of the same has been pioneered by the dedicated efforts of the business community and commerce leadership. Learning Sites, Inc., has been selected for the 2013 Best of Business Award by the SBCA Community. Being in business sets people apart from most ordinary people and the SBCA Community is dedicated to helping others understand that running a business is an obtainable goal and that everyone should try their best at living their dreams. The SBCA community recognizes and awards business owners, because they often do not receive the recognition they deserve. Business owners are role models for everyone whether they know it or not. SBCA Community 2013 Best of Business Award winners are a valuable asset to their community and exemplify what makes small businesses great. The Small Business Community Association is dedicated to collecting and organizing information, training, and services that are vital to small business owners, entrepreneurs, and anyone else that needs help running a business, operating a business, or wants to know how to start a business. The mission of the SBCA Community is to promote a vibrant and growing small business community, support education that will preserve and extend the future of small business and use our gifts within the small business community to serve others for the betterment of our world. The SBCA Community vision is to enthusiastically advance small businesses in three key areas: Growth--To assure a vibrant and growing small business community, our goal is to introduce, engage and mature the next generation of small business owners. Advocacy--We feel it is fundamental to support education and action outside the small business community that will preserve and extend the future of small businesses. Compassion--e believe it is essential that we use our gifts within the small business community to serve others for the betterment of our communities and world. The Small Business Commerce Association (SBCA) is pleased to announce that Learning Sites Inc. has been selected for the 2009 Best of Business Award in the Computer Graphics category. About Small Business Commerce Association: The Small Business Commerce Association (SBCA) is a San Francisco-based organization. The SBCA is a private sector entity that aims to provide tactical guidance with many day to day issues that small business owners face. In addition to our main goal of providing a central repository of small business operational advice; we use consumer feedback to identify companies that exemplify what makes small business a vital part of the American economy. June 2006 -- LEARNING SITES, INC., has been selected as one of the best educational resources on the Web by StudySphere. StudySphere is one of the Internet's fastest growing sites of educational resources for students, teachers and parents. StudySphere has scoured the Internet to select only the finest sites to be included within its listing of educational links. Learning Sites' Vari House model has been selected by Simon & Schuster Corp. as the only virtual world to appear on their new public school education Website. Learning Sites' Vari House has been selected by Silicon Graphics Corp. as one of the top 10 educational VRML virtual world packages. Learning Sites has been selected as a VRML Excellence Award winner in education by the World Movers group.